Want to be notified of new releases in spegelius/filaswitch? Filament switch post-processor for Simplify 3D (3.1.1, 4.0.x) and Prusa Slic3r (1.36.2,1.37.1,1.38.6). This tool's main function is to add support for multi-color printing with single nozzle-multiple extruder systems to those slicer software that don't support such systems. The main functionality is similar to Prusa MMU Slic3r's purge sequence. Main target currently is Simplify3D, which has support for multiple extruders, but doesn't have support for required advanced purge tower functionality. Currently supports and tested with Prometheus System and Prusa MK2 MMU (Prusa support thanks to https://github.com/paukstelis). After old filament is retracted fully, new filament is fed. To clear the color of old filament, some amount of purgin is needed and filaswitch does this by printing the purge material to the tower. Purge amount is configurable. filaswitch detects if this feature is enabled in S3D profile and applies the fix automatically. A note about Prusa Slic3r: of course Prusa MK2 MMU users don't need this appication as Prusa Slic3r is made for the Prusa MMU. However, Prusa Slic3r is really nice slic3r and it can be used with other printers. At least for now, the Slic3r's multi-material settings aren't configurable enough to allow other printers use it fully. So filaswitch supports Prusa Slic3r until this changes. Disclaimer: i'm not responsible if anything bad happens due to use of this script. Python 3.5/3.6 to run this script. 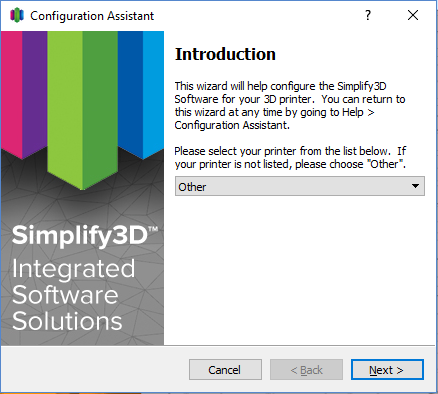 filaswitch comes with some default Simplify3D profiles (located in Simplify3D_profiles), which can be used as a base for creating your own printer profiles. New printer profile additions welcome. These example profiles probably won't match your printer configurations so some experience with setting up a printer in Simplify3D is recommended. To create a new printer profile from scratch, use 'Configuration Assistant' in Help-menu and select 'Other'. This will create a properly initialized multi-extruder profile. Don't use existing single-extruder profile. Reason for this is that Simplify3D stores the extruder settings differently depending of the initial extruder count and adding them later in the profile editor won't produce optimal multi-extruder prints. Not optimal = too many tool changes -> more waste. There's a way to edit them to the .fff file outside Simplify3D, but we won't go there right now. Add new process and finish all the settings that are specific to your printer. 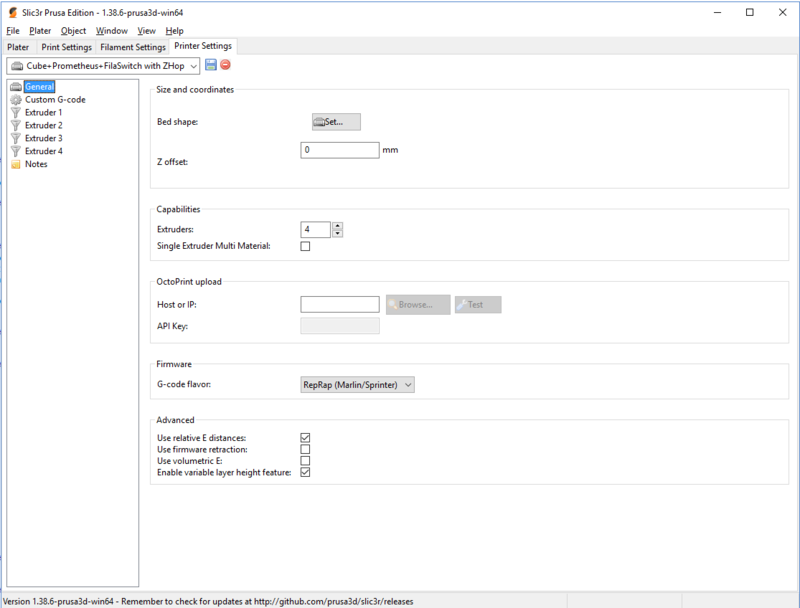 Following are filaswitch specific settings that are needed for filaswitch to work. depending of your material and cooling needs it might be a good idea to lower the minimum layer time before increasing cooling and slowing down. Filaswitch does add some extra time when printing the tower so the need for extra cooling decreases. Instructions for setting up prints TBD. 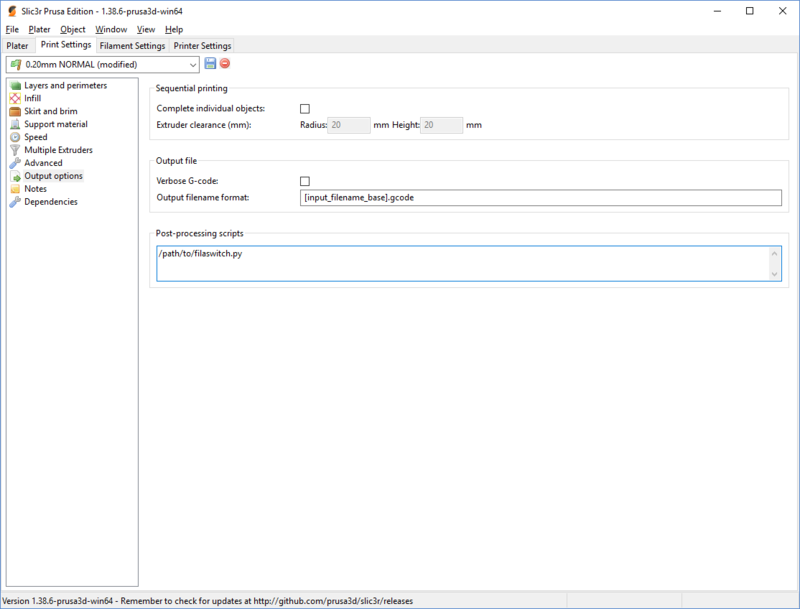 For now there isn't an example profile distributed with filaswitch for Prusa Slic3r. However, the default Prusa MK2 profile is a good starting point and in Slic3r printer settings are easy to edit. Changing extruder count works as it should (Simplify3D, take note) and settings are all logically laid out. Usin filaswitch as part of slicing has been described in slicer specific sections. This section describes how to run post-procesing manually. First slice your dual-color model in Simplify3D/Prusa Sic3r. Instructions for setting up prints TBD. Save g-code to disk. ####3.3. Printing At the end of the post-processing, filaswitch will print info about what extruder needs to be loaded or if all extruders need to be unloaded. Basically if the HW configuration you used has prerun prime enabled, all extruders need to be unloaded. If prerun prime is disabled, filaswitch expects T0 to be loaded (this might change in the future). What is prerun prime? Prerun prime is a pre-print sequence which loads and unloads each extruder used in the current print to make sure they are primed for the print. The last prime is not unloaded as print is going to start with it. Result is a new file, with _fs.gcode ending. You're ready to print :). Hw configurations are list of parameters that define how the filament switch sequence is executed. Various purge and retract lengths and peeds can be altered and even disabled by commenting lines out. Some values are required and filaswitch will fail to process if something mandatory is missing. To add new hw config, go to hw_configurations directory and make a copy of one of the existing files. The name of the file will be the name of the configuration as seen in the filaswitch GUI dro-down menu. Now alter the values as you see fit for your hardware. What configuration to copy? Well that's hard to say as your hardware might something that isn't previously supported. If you have a variation of Prometheus System, all Prometheus config variants should be a good starting point. But to properly configure the filament switch sequence, you'll need to understand your hardware anyways, so the starting point shouldn't matter that much. If you want your new shiny profile to be added to main filaswitch repo, fork the repo, make a commit to your repo and create a pull request. I'll be happy to include new configurations for other people to use. First slice your model in Simplify3D, no need to change any settings. Save g-code to disk. Usage as in section 3.